This Memorial is all that remains of Trinity Methodist Chapel that was demolished in 1976. As you can see it is now in front of a block of flats that replaced the chapel. of "Balliol," Lea Rd., Wolverhampton. Grave Reference:11805. Son of Samuel James and Sarah Botwood, of 12, Ash St., Wolverhampton. Husband of Jane Evans, of 32, Derry St., Wolverhampton. Son of George and Mary Ann Hill, of 82, Ash St., Wolverhampton. Son of the Rev. E. and Mrs. Jolliffe of "Buena Vista" Dial Hill Clevedon,Somerset. Son of William and Lavinia E. Middleton, of 20, Newbridge St., Wolverhampton. 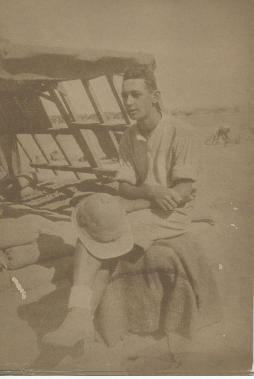 The picture of Donald Middleton (below) was kindly sent to me by his great niece. Son of Alfred and Ada Neal, of 92, Ash St., Wolverhampton. Grave Reference: XIII. L. 13. Reginald William Reade was the son of Thomas and Elizabeth Gould Reade, Mornington Place, 57, Tettenhall Rd of Reade Bros,a firm of manufacturing chemists in Wolverhampton. He was educated at Brighton College and Emmanuel College, Cambridge, graduating in 1914 with a B.A. (Cantab.). Instead of taking up a post as classics master at Glenalmond School he joined a territorial battalion of the South Staffordshire Regiment as a private and, in January of 1915, was gazzeted second lieutenant in the 9th battalion of the Royal Warwickshire Regiment. He was badly wounded at Gallipoli in August of 1915 during the attack on the Sari Bair ridge and did not return to his unit until January of 1916. August of that year saw the 9th in Mespotamia fighting for the relief of Kut. On the evening of 10th August the Falahiyeh positions were attacked. In front of these trenches was an open stretch with no cover, swept by direct and enfiladed fire. It was here that Reginald Reade, now a temporary lieutenant, was killed. A fellow officer described his death as follows, 'After a hard day's fighting we were ordered to carry out a night-attack against an entrenched position. We had to advance across 1300 yards of perfectly flat ground without cover of any kind, and under heavy rifle and machine gun fire. He was in command of a company and led his men most gallantly right up to the enemy's trench, which was taken by us. He was killed at the moment we entered the trench. He was killed instantly and was spared all suffering…We all loved him for his steadfast, cool courage and unruffled good fellowship at all times'. Son of Roger and Mary Tildesley, of 11, Laburnum St., St. Mark's Rd., Wolverhampton. Son of A. R. and A. Weaver, of 30, Cleveland St., Wolverhampton. Son of Maria Webster, of 19, Cardiff St., Wolverhampton, Staffs, and the late Job Webster. Completed 16 years' service. Son of F.W. Whitlock, of 137, Tettenhall Rd., Wolverhampton; husband of Elsie L. Whitlock, of 21, Avondale Rd., Wolverhampton.